In 2015 I started as a postdoctoral researcher at the Soil and Water Conservation Research Group at CEBAS-CSIC. We studied the catchment-scale impact of climate change on hydrology and soil erosion in a semi-arid Mediterranean catchment. Next, we studied climate change adaptation through large scale implementation of Sustainable Land Management (SLM). During this project we developed a new proces-based soil erosion model. We coupled an existing soil erosion model (Morgan-Morgan-Finney) to a hydrological model (SPHY). The model code of the new model can be downloaded here. Climate change will strongly affect essential ecosystem services, like the provision of freshwater, food production, soil erosion and flood control. Sustainable Land Management (SLM) practices are increasingly promoted to contribute to climate change mitigation and adaptation, but there is lack of evidence at scales most relevant for policymaking. We evaluated the effectiveness of SLM in a large Mediterranean catchment where climate change is projected to significantly reduce water security. We show that the on-site and off-site impacts of climate change are almost entirely reversed by the large-scale implementation of SLM under moderate climate change conditions, characterized by limited reductions in annual precipitation but significant increased precipitation intensity. Under more extreme reductions of annual precipitation, SLM implementation reduces the impacts on water security, but cannot prevent significant increased plant water stress and reduced water availability. Under these conditions, additional adaptation measures are required considering their interactions and trade-offs regarding water security. Assessing the impacts of environmental change on soil erosion and sediment yield at the large catchment scale remains one of the main challenges in soil erosion modelling studies. Here, we present a process-based soil erosion model, based on the integration of the Morgan–Morgan–Finney erosion model in a daily based hydrological model. 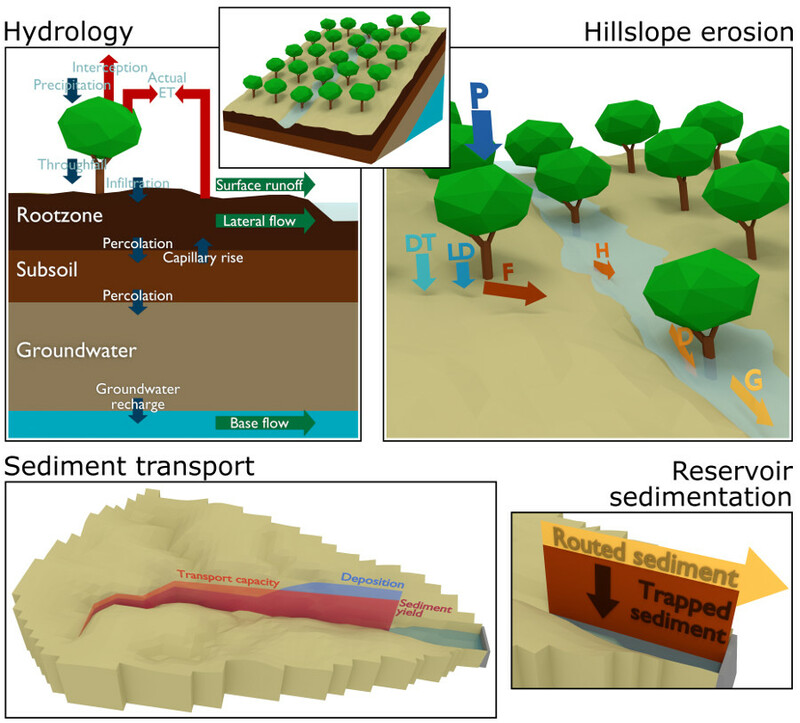 The model overcomes many of the limitations of previous large-scale soil erosion models, as it includes a more complete representation of crucial processes like surface runoff generation, dynamic vegetation development, and sediment deposition, and runs at the catchment scale with a daily time step. This makes the model especially suited for the evaluation of the impacts of environmental change on soil erosion and sediment yield at regional scales and over decadal periods. The model was successfully applied in a large catchment in southeastern Spain. We demonstrate the model’s capacity to perform impact assessments of environmental change scenarios, specifically simulating the scenario impacts of intra- and inter-annual variations in climate, land management, and vegetation development on soil erosion and sediment yield. The parameterization of crop coefficients (kc) is critical for determining a water balance. We used satellite-based and literature-based methods to derive kc values for a distributed hydrologic model. We evaluated the impact of different kc parametrization methods on the water balance and simulated hydrologic response at the basin and sub-basin scale. The hydrological model SPHY was calibrated and validated for a period of 15 years for the upper Segura basin (~2500 km2) in Spain, which is characterized by a wide range of terrain, soil, and ecosystem conditions. The model was then applied, using six kc parameterization methods, to determine their spatial and temporal impacts on actual evapotranspiration, streamflow, and soil moisture. The parameterization methods used include: (i) Normalized Difference Vegetation Index (NDVI) observations from MODIS; (ii) seasonally-averaged NDVI patterns, cell-based and landuse-based; and (iii) literature-based tabular values per land use type. The analysis shows that the influence of different kc parametrization methods on basin-level streamflow is relatively small and constant throughout the year, but it has a bigger effect on seasonal evapotranspiration and soil moisture. In the autumn especially, deviations can go up to about 15% of monthly streamflow. At smaller, sub-basin scale, deviations from the NDVI-based reference run can be more than 30%. 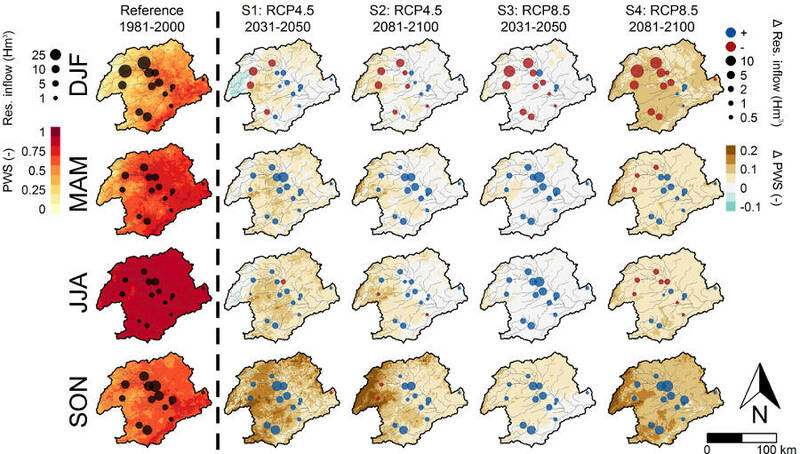 Overall, the study shows that modeling of future hydrological changes can be improved by using remote sensing information for the parameterization of crop coefficients.